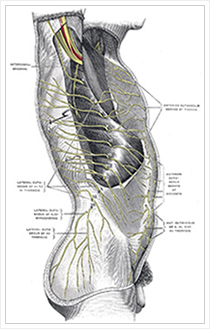 What Is an Intercostal Nerve? It is a nerve that originates from the spinal nerves in the thoracic area, from the 1st to the 12th vertebra. It runs under the ribs and provide the sensation to the skin overlying the chest and upper abdomen, up to the inside of the arm. What Is an Intercostal Nerve Injection? It is a procedure in which, a solution of local anesthetic (numbing medication) and an anti-inflammatory (steroid) is injected into a specific intercostal nerve for the purpose of diagnosing a painful disorder or treating a painful condition. Who Is a Candidate for an Intercostal Nerve Block? There are multiple conditions that can be associated with intercostal nerve mediated pain. Among the common ones: painful rib fractures, post chest and heart surgery pain, muscle sprain, shingles, chest trauma etc. Sometimes the procedure is performed to diagnose or exclude a pain source. It also assists in rehabilitation and planning for further interventions. The response can be permanent, or the injection may have to be repeated. It all depends on the source of the pain. Next, the skin overlying the painful nerves or areas will be cleansed with a sterile solution. Then a solution of local anesthetic (numbing medication) and an anti-inflammatory (steroid) is injected into a specific intercostal nerve, under fluoroscopic guidance (X-Ray machine). You will go back to the post anesthesia care unit ( if you received intravenous sedation), where you will be monitored for 30-60 minutes according to your response. If no sedation was used, according to your specific condition, you may proceed to the post procedure observation area. Immediately after the procedure, you will be evaluated to assess for specific response. A post procedure evaluation form to assess the effectiveness of the injections will be given to the patient prior to discharge. Post procedure instructions will be given in a pre-printed form. A follow up appointment will be made for follow up and to determine if a repeat injection may be necessary. Frequently, according to your specific response, more injections may be indicated. It is not advisable that you drive the day of the procedure. After this procedure, although remote there is a possibility of developing shortness of breath within 24 hours. If this happens contact the nearest emergency room for care.